The French Car Show 2018 was held at Donington Park circuit during the intense heat of early July. 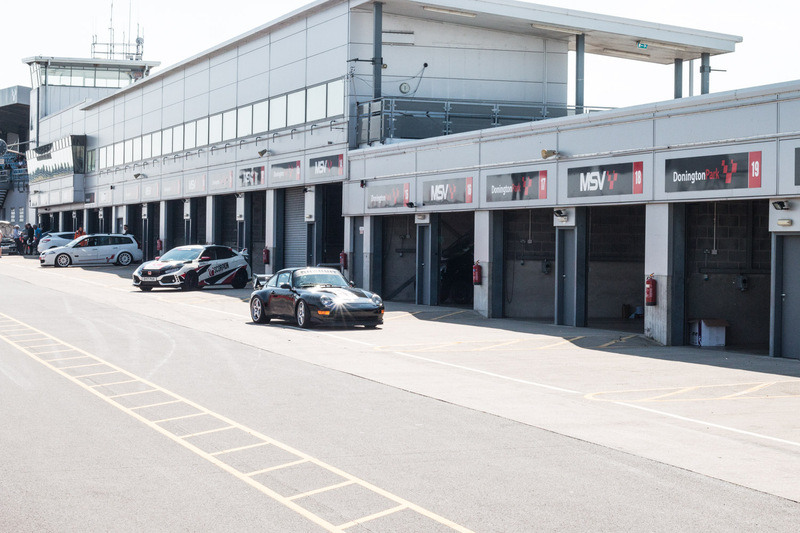 The sun held out for the whole day so the cars had an extra shine after being detailed by their owners, who all had an impressive amount of kit just to get their cars looking perfect. The Peugeot, Renault and Citroen event certainly lived up to my expectations with stunning examples of some of my favourite cars, the Renault five and Peugeot 106. 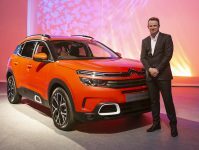 There were hundreds more cars that caught people’s attention, some for good reasons and some for unusual reasons too at the French Car Show. 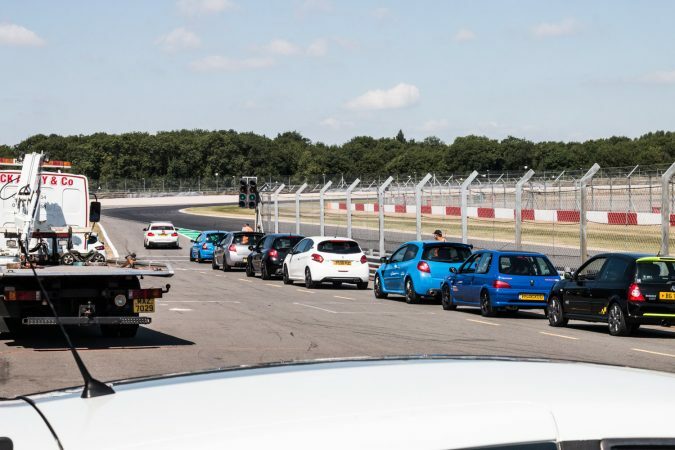 The atmosphere of the event was pretty relaxed with people taking their time to walk round and talk to other car owners, that was until the next track session started and it was clear that people couldn’t wait to take their cars out on track. Getting into the event was interesting as you drove through the middle of all the track car parks around the main entrance, seeing them empty gave you a feel for how many people would be there for big events. Once into the track area, the ‘non-club’ car park was in the far corner in front of where Redgate Lodge once was. For anyone unfamiliar with Donington Park, the first corner is Redgate and there was a famous pub there where people would go to drink after events, it had to be removed so that there was more runoff when bikes race at the track. After parking, the first thing I could hear after getting out, was the cars on track and it was evident that they were not just cruising around and taking it all in. The sound of the cars just dragged me over to the first corner to watch them come down the pit straight, around and down towards Craner curves and Old Hairpin. 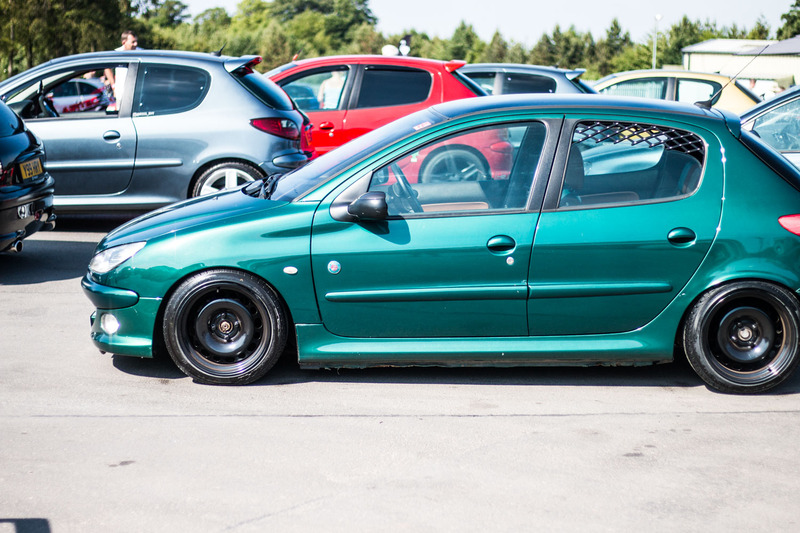 Seeing the kitted out Saxo’s, 106’s and Clio’s was especially pleasing for me as these are the types of cars I have been driving mainly. During the session that was underway, cars were going out on track and coming off whenever they pleased as it was an open pit lane during session times all day. Cars were coming off and parking back in their spots for people walking around to view. 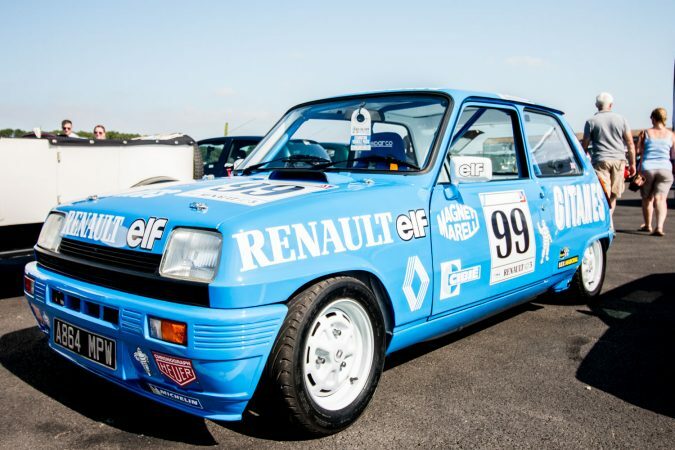 Whilst walking around, one care that particularly caught my eye was a Renault 5, in Elf race team colours. 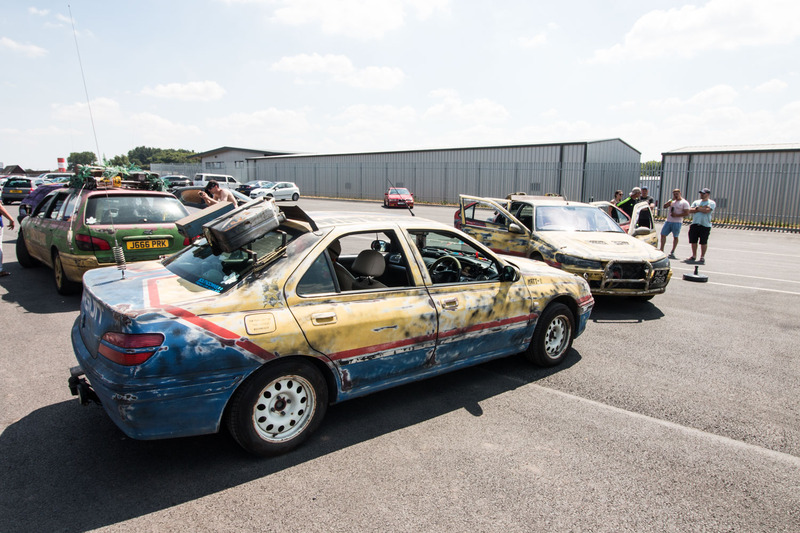 It was completely gutted, with a single bucket seat in amongst the roll cage, complete with everything that was needed for it to be legal to race. Sadly this was not taken out on track, which is hardly surprising considering the immaculate condition it was in, and perhaps more importantly, the money that it is worth. It was certainly a car that has had a lot of money put into it. As I have previously mentioned, my first car was a Peugeot 106, and there were plenty of them at this event, it was probably the most popular car there. It was amazing to see so many examples, mostly track-ready lightweight race cars, although there were a few slammed versions dotted around. Seeing all of them in their glory really made me wish I had kept mine. 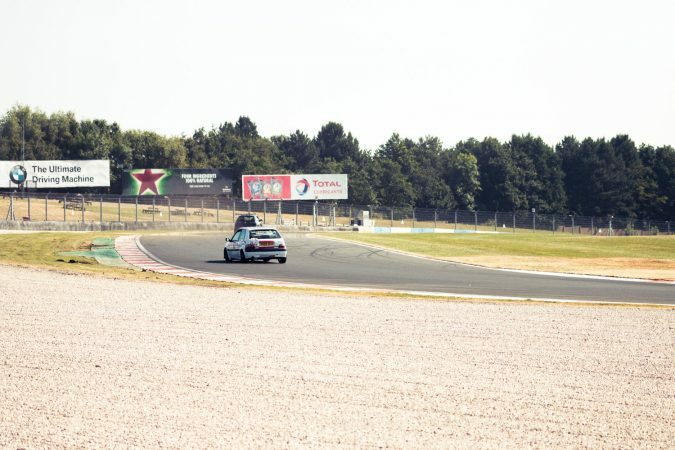 The 106’s were always prominent on track, seeing them race past with one wheel in the air was impressive, them and the saxo’s seemed to be going slow if they didn’t get their rear wheel to lift a little around the first section of the track. 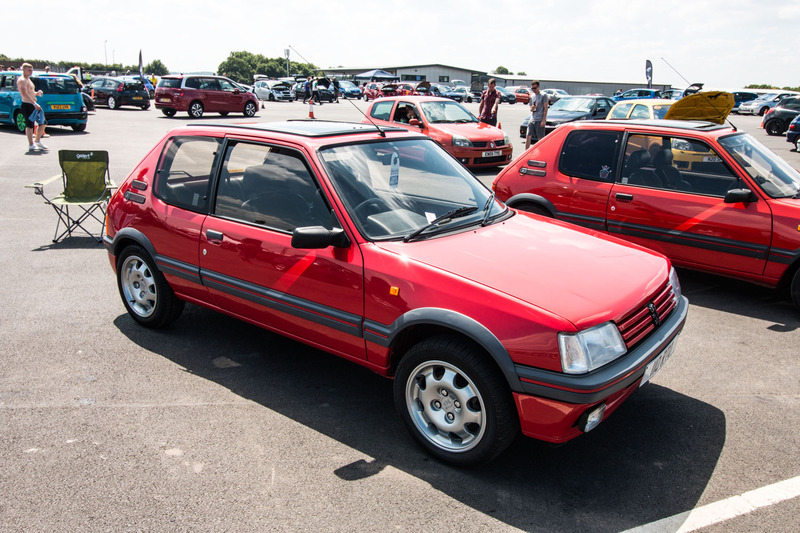 The other popular Peugeot, in terms of people looking at other than amount of cars their, was the 205 GTI. Worthy of the crowds however, as every one was pristine with original everything and the owners were clearly very proud to show off the condition of their cars, with one 205 convertible owner manufacturing his own 45 degree angled mirror for the front and back of his car so that you didn’t have to lie on the floor to see the undercarriage. You could really see the level that they had gone to, to make the car the same as when it rolled out of the factory, it looked brand new and the mirrors did give you a feel for how these people felt about their cars. 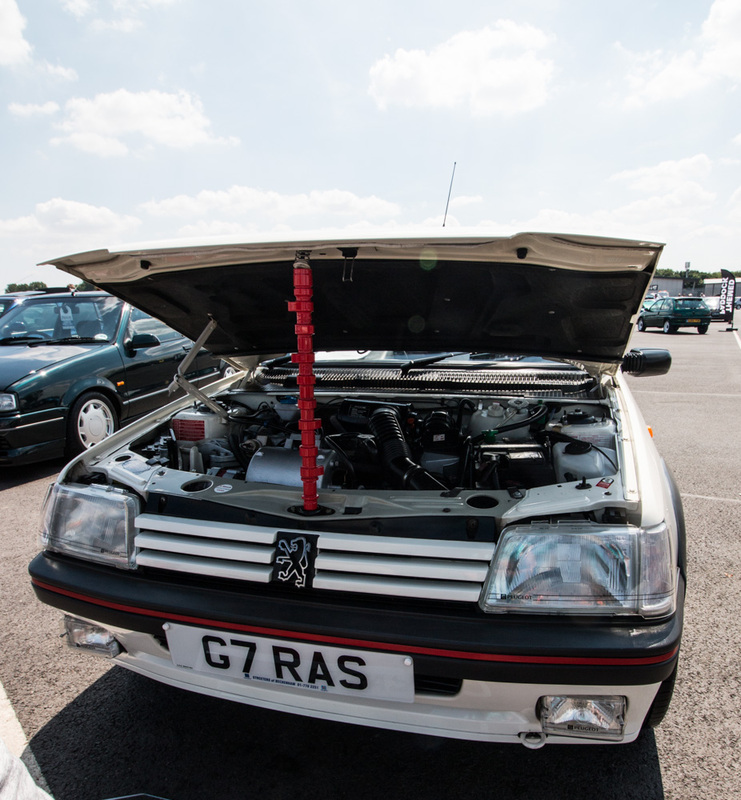 Over the far side of the paddock area at the French Car Show were some more unusual cars. To begin with, a Peugeot 307 convertible with suicide doors and slammed to the ground. The look was impressive, unusual and maybe a bit overkill, however I think that was intended, it was a conversation starter for sure. 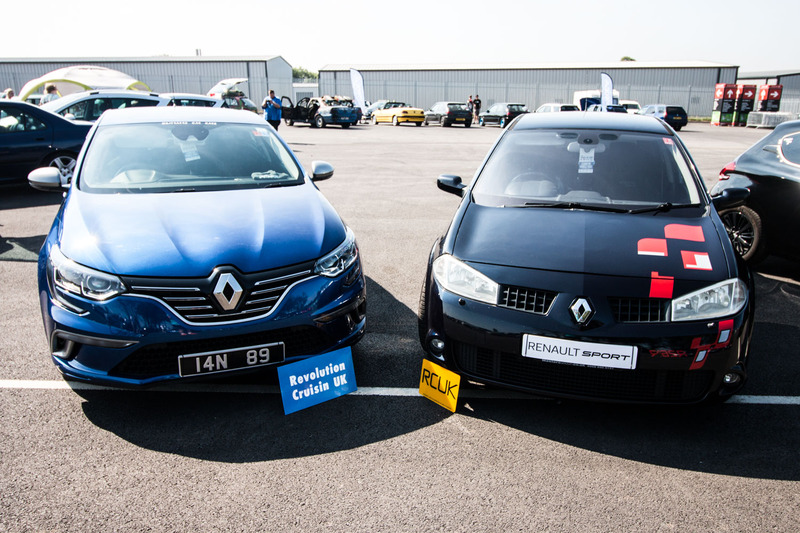 A particularly interesting car, for me, to see on track was a white Renault Megane estate. It was an old model and had been completely gutted and had been completely transformed into a lightweight race car. 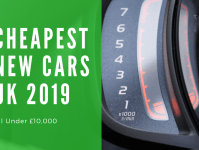 I drive an estate which made me appreciate seeing it overtake most of the cars out on track, it was insanely quick and it being an estate made it look ten times faster. After looking around all the cars it was finally my time slot for passenger laps. Earlier in the day I had gotten my passenger wristband and for £15, including helmet hire, I was going to go out in a Peugeot 207 that was put together by CRD Racing and driven by a young racing driver. I was looking forward to a chat with him to find out more about him whilst we were getting ready and driving to the track, however, the slot before me ended short and they explained that the gearbox had blown up. I was disappointed but that happens, the driver looked extremely gutted and you couldn’t help but feel for him. After getting everything sorted with the CRD team, I venture up the pit lane and asked the Nankang team if I could ride along with them. Surely enough they said hop in immediately. 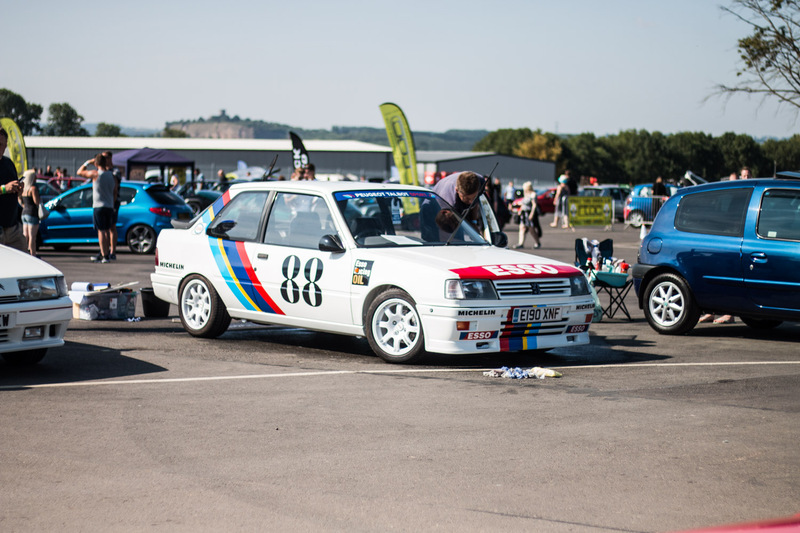 They had brought two cars with them to the show, a Porsche 911 Carrera Cup and also a Citroen C1. Everyone else was asking to go in the Porsche but I was more excited to see what the C1 was like on the track, and Karol the driver took me out there and then. I asked Karol a few questions before we got in the car. I wanted to know about him and the C1. 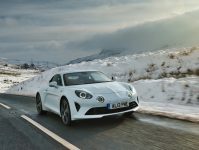 He explained that the C1 was mostly stock, all that had changed was removing the interior and installing the roll cage and bucket seats with harnesses for safety, and the front wishbones had to be changed for regulation too, other than that it was still a normal 68 horsepower C1 covered in the teams livery. Karol told me that they enter the C1 in 24-hour team races around Europe, his favourite track that they go to is Spa. I asked Karol if he had driven the Nankang Porsche that was on the other side of the Garage, he said no but not only does he prefer the C1, he has owned three Porsches himself. He has owned and raced two older models but his most recent was a GT3 RS that he had put 30,000 miles of track driving on. Karol wasn’t the only driver that was with the team, he had a partner with him and they took turns to take people out, after chatting with Karol whilst the other driver was out, it was my turn to go out on track. After getting into the car, which was a bit of a struggle being six foot four and trying to get my legs in through the roll cage and the harness done up, we set out. Driving down the pit lane and out onto the circuit was a surreal experience for me, it is one that I love and being out on it gives you a new appreciation for the circuit and the drivers. Coming around Redgate after coming from the pit lane we weren’t going full pace so it was nice to look around and see a new perspective, then Karol put his foot down and the C1 took off through Craner Curves and we sped towards Old Hairpin. It being the first passenger lap I had ever been on meant that I didn’t know what to expect really, I knew it would be late braking and bracing speeds, but watching the other amateurs drive round it didn’t look too extreme to me, this is where you could see Karol’s level of experience, he braked so late and carried the speed with a full four-wheel drift around most corners. 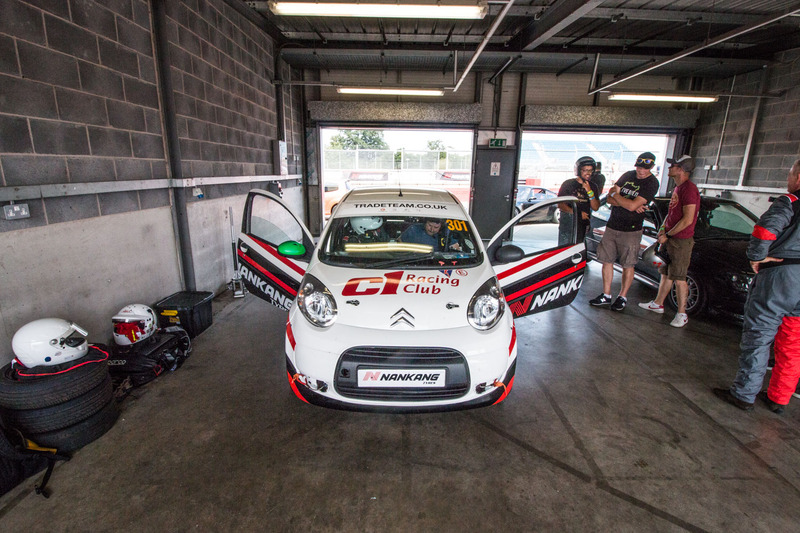 The C1 really shifted and being small and light, and having a pro driver like Karol, meant that it was seriously quick. 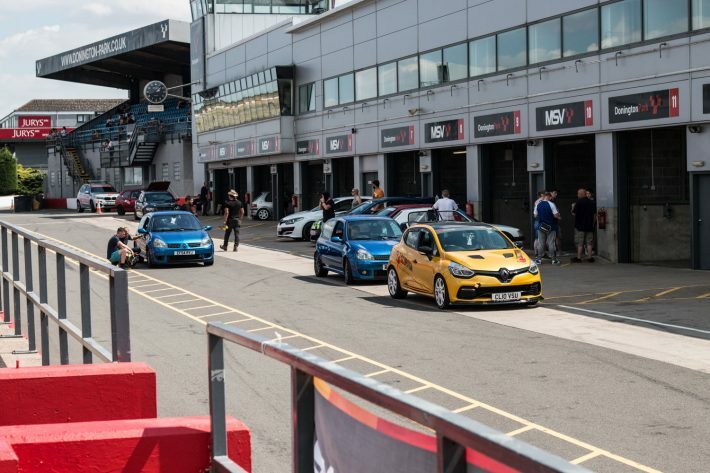 There were a lot of cars out on track with us and three Renault Megane RS were overtaking us on the straight, but Karol explained how they had the power on the straights to overtake, but when it came to the corners they had to brake harshly and the C1 would overtake again. 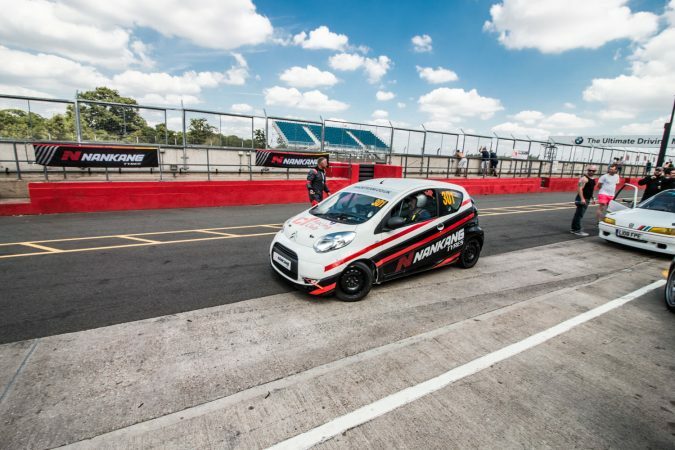 The C1 really was an amazing car to experience the track in, the Porsche that Nankang had looked good but the driver couldn’t throw it about like Karol was doing in the C1, I had a smile on my face the whole time and appreciated the level of Karol’s driving skill. The experience was so good that I made my dad, who had come with me to the event, have a go. Karol was nice enough to take him to get a passenger ticket and take him out after me. If you ever get a chance to go out at Donington, take it, it was the best experience I’ve had. Overall this event was more than I could have anticipated, the amount of nostalgia the 106 and 206’s brought back made me want to buy my old car back, and the track experience and listening to some of the other amateur drivers that tracked their cars made me start looking for a car I can take on track days myself. It was good to see that the cars out on track were allowed to go as hard and fast as they wanted, there was one track limits camera down by the Craner Curves in the fast section, but only one car was black flagged from the whole day. 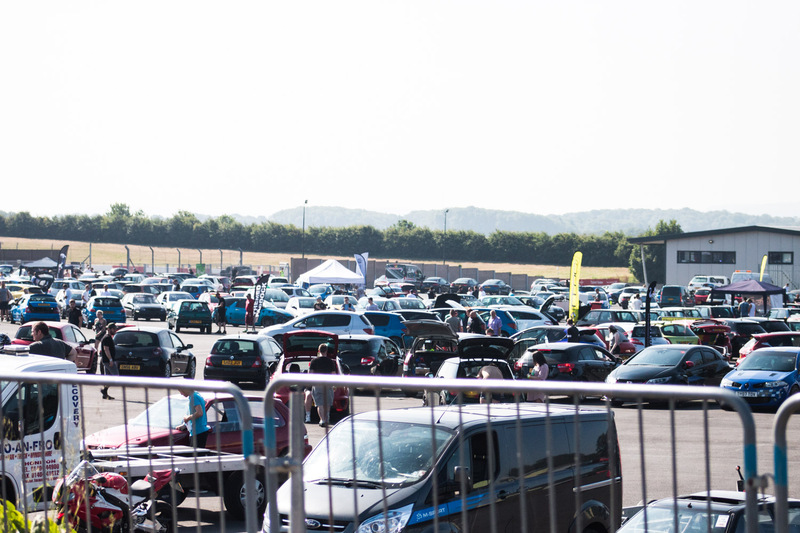 There was also a 98 decibel limit for the weekend, a 106 club in the far corner did decide the break that limit and all line up to rev their cars and the pops and bangs certainly smashed the limit and attracted everyone from the paddock area over to watch. 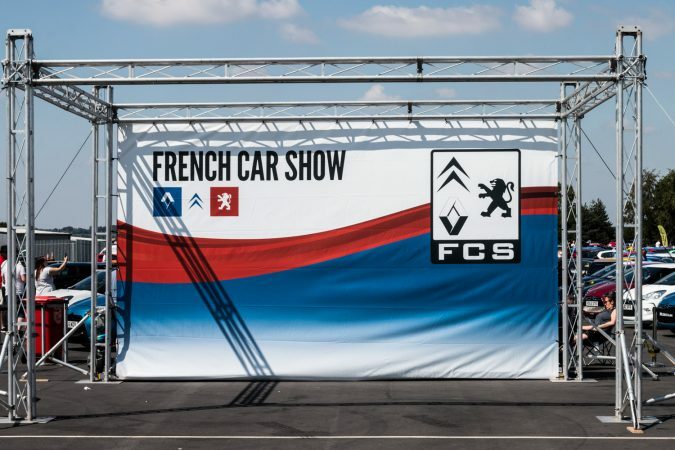 That sums up the atmosphere of the event, everyone having a laugh and enjoying cars with their friends and also with the strangers that just share the interest in the French cars around them. Seeing that atmosphere and spirit of the day made me want to sell my car and get a French one to join in! 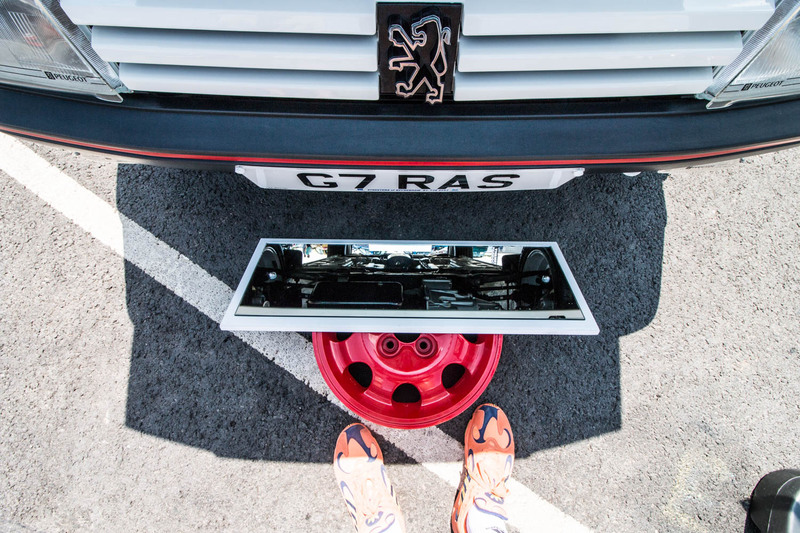 At the end of the day the French Car Show organisers were offering free photographs to anybody that wanted them. They had a branded advertisement for the event set up which you could park your car in front of and a photographer would take your photo and print it for you too keep, it was a nice touch and I just wish I didn’t drive a ford so I could have had one done too!